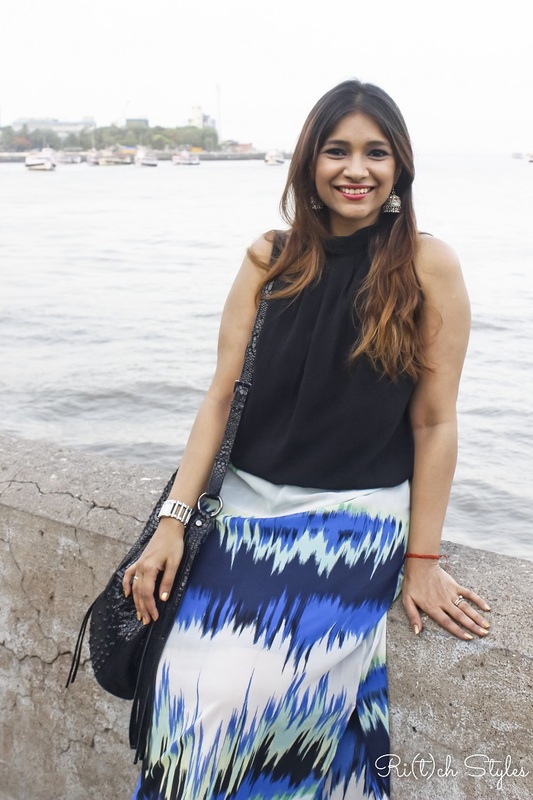 Ri(t)ch Styles : Indian Fashion, Beauty, Lifestyle and Mommyhood Blog: 3 Desi Twists To Your Western Wear! The Indo Western fusion look has always been one of my favourites. Especially the combination of Indian accessories with Western wear. Making them work together is something that comes naturally to me, but I have always received queries from a lot of you on how it can be done. 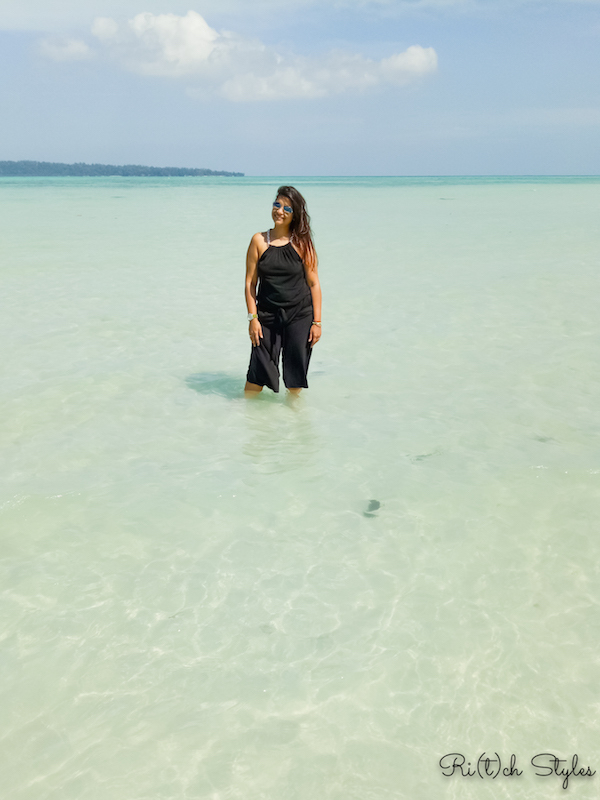 Most people haven't moved beyond the Kurti Jeans look, but trust me there is so much more that can be done. I am going to tell you 3 simple ways in which you can add the 'Desi' twist to your Western wear. Now all of us wear dresses, and all of us have ethnic party clutches in our wardrobes thanks to the number of weddings we attend in the year. So if you are invited for a party, instantly add an ethnic embroidered clutch bag to the dress and voila you are set to go! You can add a metallic clutch to go with your accessories if your dress is in monochrome tones, or if your dress is bright in colour then go for a clutch that is in complementing contrast colours like I have done in the picture above. 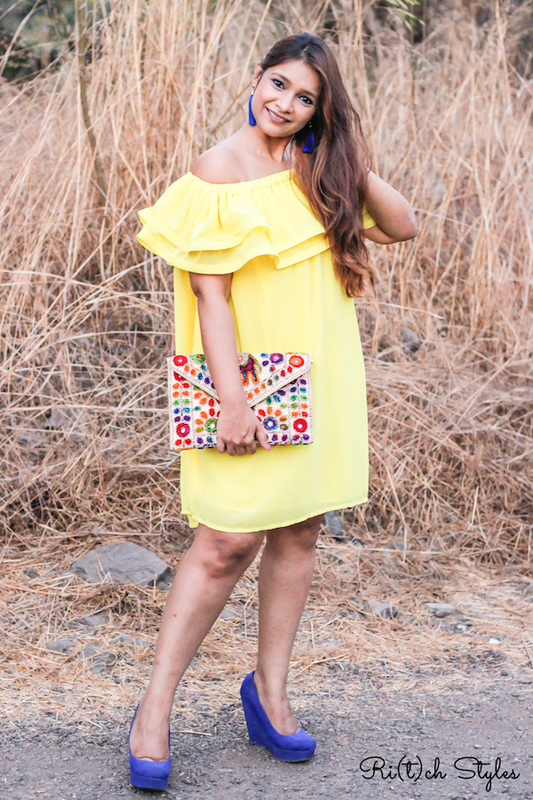 The colourful look of the clutch adds such a pretty and playful vibe to the whole ensemble. I am a hoarder of ethnic clutches and I buy clutches online as well as from local fairs and exhibitions. There is nothing like a basic outfit to complement special things especially statement Juttis! When it comes to picking up Juttis, my choices tend to gravitate towards embroidered, colourful, printed and embellished ones. As you can see above, my favourite pair currently are these bright colourful ghungroo juttis that I generally pair with a basic top and jeans. I usually pick up the Rajasthani or the Punjabi Jutti and the easiest way is to just order my juttis online. Pairing beautiful Indian jewellery with Western outfits is the easiest thing to do. I love pairing my beads and kundan necklaces with dresses and tops. They add instant glamour to my outfits and take them a few notches higher. I mean you don't need to wait for festivals or weddings to take your heavy necklaces out, you can just be smart and use them the year round this way. See how seamlessly I have paired my black onyx and kundan necklace with a red dress, and the ensemble looks so chic! Jhumkas are also just another way to add oomph to your outfit. See how they add awesomeness to my look above. However just make sure to not go overboard and add any more heavy jewellery to the face/neck area when you do this, as just one element is more than enough. Ethnic bangles are also a great way to add Indian-ness to your outfit. You can check out some beautiful ethnic jewellery online at Jivaana. 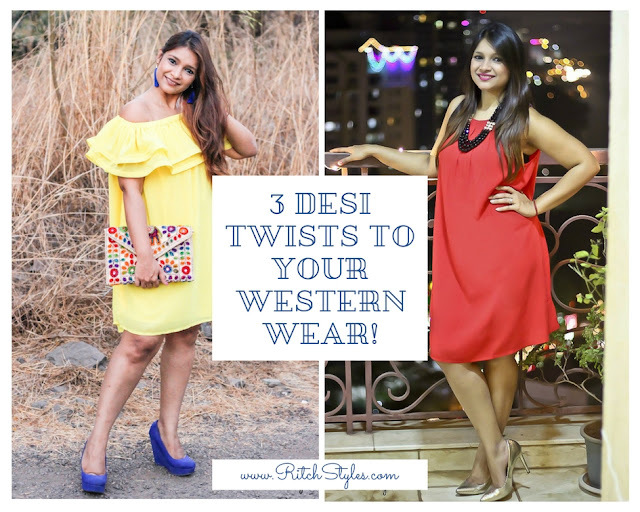 These tips will help you create multiple looks and add a Desi Twist to your Western Wear. For more such tips stay tuned as we have lots of interesting stuff coming up this summer for you! My favourite is ethnic dresses. I also love to team ethnic jewelry with Western wear. I love ethnic jewelery with western dresses too. oh. love all the styles on you ritcha. Will check out the ethnic jewelery range ..
the kundan necklace with red dress is absolutely stunning. I would have never thought of putting the two together. I love pairing ethnic jewellery with western outfits. Nice post.